When I was checking the statistics on the website, an awful lot of you are searching for serial killers (Ed. note – Any number above 0 is deemed “an awful lot” when it comes to serial killers). 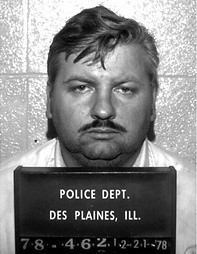 The above picture is John Wayne Gacy. I didn’t want to get into full detail of John Wayne Gacy’s activities because the FBI tracks that sort thing and I wouldn’t last long in prison. This entry was posted in Burn in Hell Steesh, Criminal Steesh and tagged Criminal, John Wayne Gacy, Moustache, mustache, serial killers on June 25, 2012 by Johnny Gerkins.